Tim Williams, the Chief Executive of Committee for Sydney recently addressed a Sydney University planning forum. Geoff Turnbull provides his impressions and pulls together some of the key elements from the presentation and its “personal opinion” aftermath. Tim Williams started his presenta­tion I Wouldn’t Start From Here by noting there is a major road revolu­tion going on and not much has been said about it. In contrast Williams was keen to have a conversation also about the public transport revolution Sydney really needs. 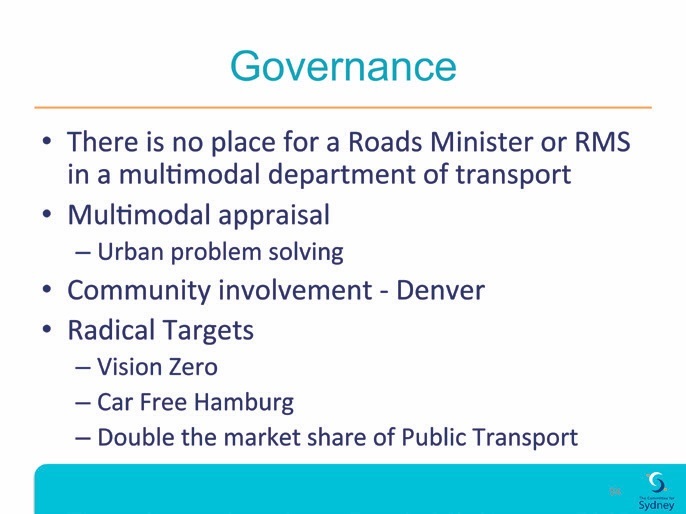 He wanted to talk about the need for a modal shift from road to public transport and why it is impor­tant. He said if we are trying to get a modal shift it is on the quiet. He didn’t think there has been enough discussion, by even those advocating for public transport, with our community as to why they should buy in to public transport revolutions and why they will be a good invest­ment. Williams said we need to have a grown-up dialogue over the heads of the politicians, who he thinks are not capable of having a brave dialogue in our culture at the moment about so many things. Williams argues we need a mode neutral process for addressing trans­port projects which understands the benefits of the different alternatives. We need to know what the problem is we are trying to solve and not frame the problem so there is only a one mode answer. An example of the latter would be – there is a shortage of road capacity which we can solve with extra road capacity. For Williams we need demand management. We must stop kidding ourselves that we can build our way to decongestion. But the trouble is, who is the we? Sydney is not something we shape; it is something that happens to us because of underpowered councils, an over-powered state government and the lack of a metropolitan Sydney governance body to shape its own destiny. Williams asked the question – Can yesterday’s institutions produce tomorrow’s solutions? He does not think so and pointed out that there is no strategic or structural planner of Sydney at this point of time apart from Roads and Maritime Services (RMS). 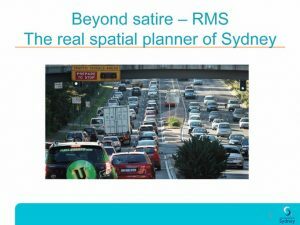 RMS is the structural planner for Sydney and unlike the Depart­ment of Planning he said it has money and tools of its own so it can drive its own agenda. Like Elder Cato in the Roman senate who continually said “Carthage must be destroyed”, Williams said it was time for RMS to be reconstructed or rather be bought into some discipline under the strategic management of Sydney and it has to be done soon. George Orwell once said that a nation was a family with the wrong members in control and Williams thought that also applied to the current situation. 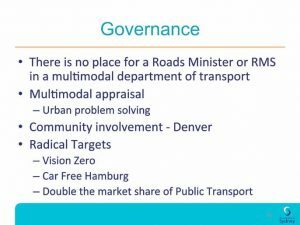 Later when dealing with governance Williams concluded there is no place for a Roads Minister or RMS in the multimodal Department of Transport that he thought was needed. Williams provided a shopping list of the wonderful achievements that we can’t possibly have in one place but that should be what Sydney aspires to incorporate from other cities. Be as affordable as Hong Kong, with a similar modal split and level of smart-card acceptance. It would also have as few vehicles as Hong Kong. Ensure air is as pure as Stockholm’s. Be as safe as Copenhagen. Have best-in-class bike sharing as demonstrated in Brussels and Paris. Have a public transport service as frequent as the London Tube. Have best-in-class car sharing as demonstrated in Stuttgart. Have as minor an impact on climate as in Wuhan. Ensure travel times are as short as they are in Nantes. For Williams roads equal sprawl and a dispersed development model for Sydney. The current Plan for a Growing Sydney said, “It is critical not to repeat the mistakes of the past – dispersed housing growth that resulted in a sprawling and poorly connected city, complicated by unique geographic constraints”. It disturbs Williams that the first bit of the statement is being undermined by the building of the roads. 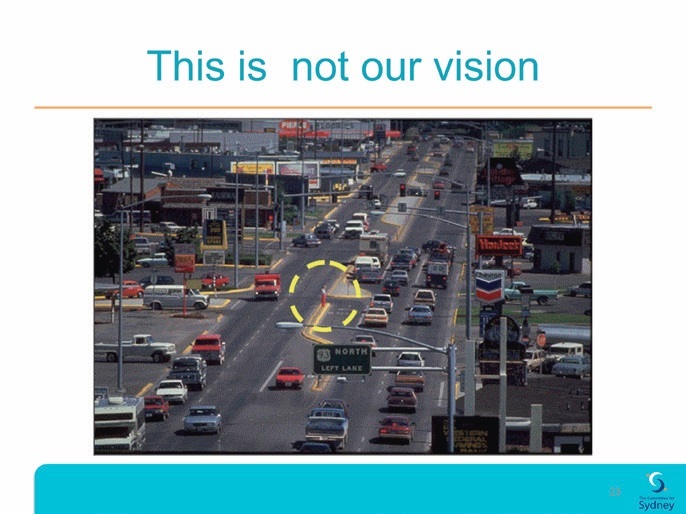 While the vision is correct it is not being deliv­ered and cannot be delivered by road builders. In support of this he referred to a number of studies including Peter Newman’s Cities and Automobile Dependence which showed a relation­ship between car use and sprawl. Williams was particularly concerned about developments like WestConnex being described as busting congestion. On ABC news on 25 November 2014 Premier Mike Baird argued the West­ern Harbour tunnel, and a WestConnex extension at Rozelle, would alleviate congestion on the Sydney Harbour Bridge, Anzac Bridge and the Eastern Distributor, as well as in the CBD. Mr Baird said “By busting congestion we will allow people to get to work quicker and home sooner to spend more time with their families”. In contrast Williams quoted the respected Victoria Institute of Trans­port as saying “Traffic congestion tends to maintain equilibrium. If road capacity increases, the number of peak-period trips also increases until congestion again limits further traf­fic growth”. The problem of induced demand – if you build it they will come! New roads induce new demand, congestion returns to equilibrium. 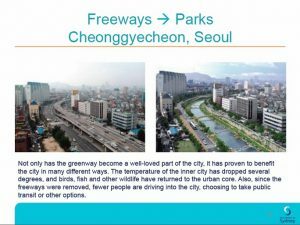 The reverse has also been shown to be true; removing a road can actually reduce demand and reduce congestion. The evidence is that unless supported by demand management approaches and significant new capacity in public transport, building or widening roads in a dynamic city actually induces more car journeys and that any relief offered by such new road capacity is temporary. 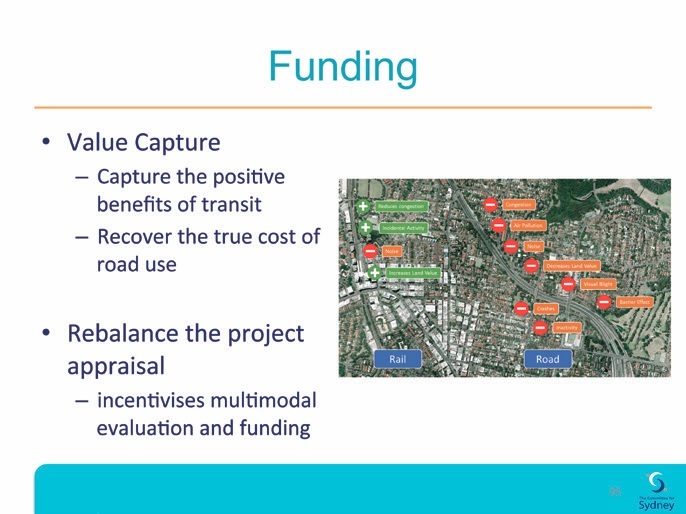 Williams pointed out that in the UK, traffic modelling requires induced demand to be taken into consideration in appraisals and this has stopped road expansions. Traffic cures are like hangover cures argues Williams – they are tempo­rary, illusory and don’t address the root problem. Interestingly, when you take a highway out of a city, conges­tion doesn’t actually worsen – traffic re-routes or flows to other modes. Many other cities in the world are taking their highways out and Williams wonders what is so different about the Australian Sydney experience that means they are wrong and we are right. 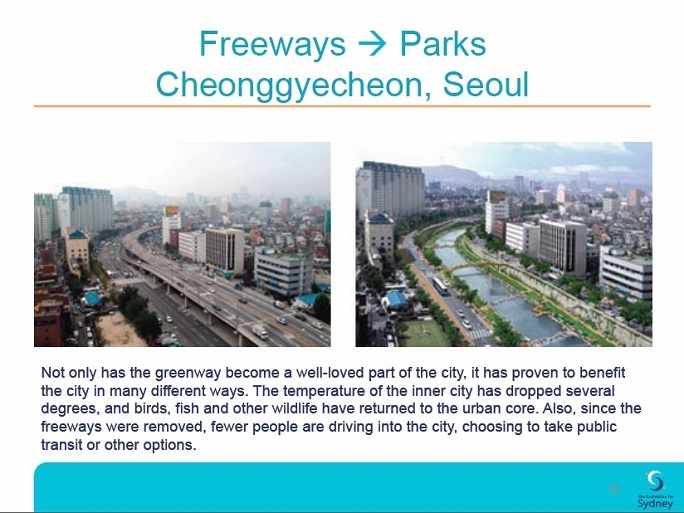 Later in his talk Williams provided many examples of cities that have been successfully removing freeways and reaping the benefits. Reducing capac­ity can reduce demand. Rhetorically he asked – RMS knows this don’t they? Following reporting of Williams’ comments in the Sydney Morning Herald, a letter to the editor jointly from Committee for Sydney’s Chair Lucy Turnbull and Tim Williams sought to “clarify that Tim William’s talk … expressed his personal opin­ion”. This was despite all presentation slides having the Committee’s logo and Williams’ referring throughout to aspects of the Committee’s vision for Sydney. The letter went on to say “We have long supported the principle of a well-integrated WestConnex project which combines improved travel times and reduced congestion, and enables the creation of more housing and urban renewal along Parramatta Road.” The joint statement contradicts Tim Williams’ presentation comments on congestion. The SMH pointed out “The criticism was powerful and unusual because of Mr Williams’ position as head of an organisation that represents firms that might expect to benefit from the construction of new motorways, and particularly the $15 billion WestConnex project”. 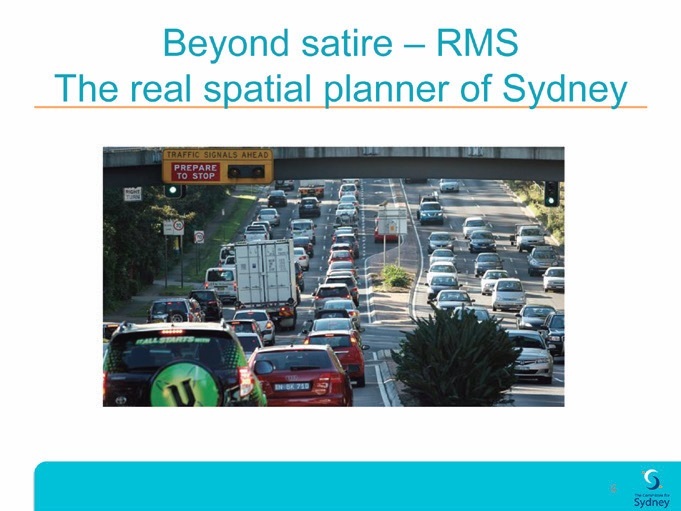 In separate commentary the planning site The Fifth Estate reported on the presentation welcoming Mr Williams’ comments and in the aftermath argu­ing that “We need a Committee for Sydney that represents Sydney”. The need for the brave grown up dialogue Williams called for remains. Geoff Turnbull is the co-editor of Inner Sydney Voice and attended the presentation. Since this article was produced Roads Minister Duncan Gay has gone publiuc on the role he playeded in presuring the Committee for Sydney. You can see the SMH report Roads Minister Duncan Gay admits to angry phone calls over WestConnex criticism based on his response in NSW Parliament. Minister Gay followed this up with comments Roads Minister Duncan Gay: chattering classes are more of a pollution risk than trucks and the SMH response Duncan Gay says no one would carry a fridge on a Sydney tram? Challenge accepted. Note: For some time after the presentations Sydney University displayed the PowerPoint presentation on their website. This has subsequently been removed.